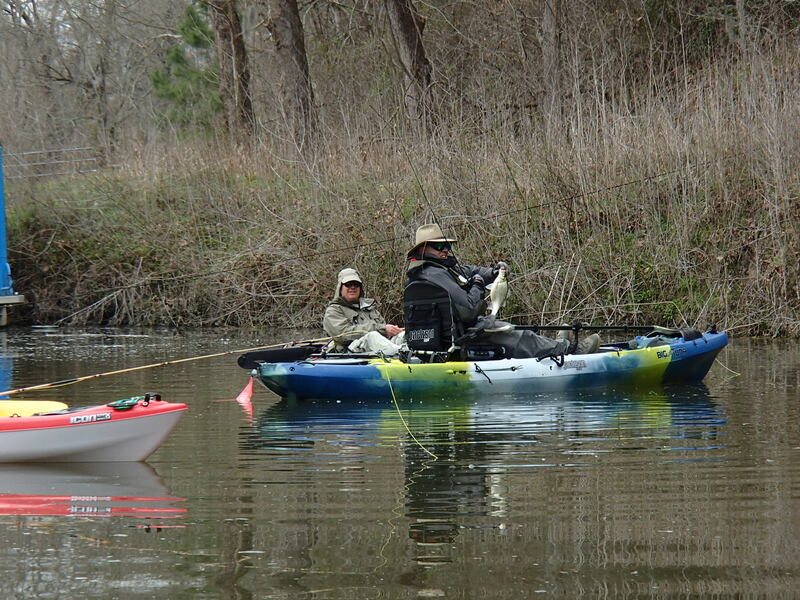 Trip Description: Fishing for white bass as they run up the Trinity River out of Lake Livingston on their spring spawn. The 3 cabins are now reserved. Each has one double bed, a futon, and a loft. The first ones to sign-up get the first choice of beds. The beds are for Friday and Saturday night. $100 per night splint 3-4 ways makes this a very affordable trip. Double bed – John P.
As of 2015-11-12-0600, all beds that I’ve reserved are spoken for. But there are a couple of other smaller cabins, and plenty of places to camp yet available. Harmon Creek trip, 2015-03-07 trip report from the 2015 trip. The cabins that “sleep 6” only have 1 bed, 1 loft, and one futon. Don’t ask me how we managed to get 2 more cots spread out in the tiny cabin. Mike and J. set up a tent, with heater, close by the launch point. Dinner the first night was bratwurst, cooked on charcoal, with sides. 50+ white bass were caught. I actually lost count after people started telling me where, and how many were caught. One Kentucky bass and one turtle were also landed. The turtle, and the black bass, were returned unharmed to the creek. The 0700 launch turned out to be an overly optimistic guess. With frost on the boats and kayaks, the launch was delayed, and then delayed again. The last boat actually launched at noon. The white bass were all in staging pool, stacked up in deep cold, 51°F, water, and not biting very well. A lot of the ones that came to hand came to small flies drug deep. I didn’t get a picture of Phil’s fly, but I watched him pull in a few fish without ever changing it out. Mary-Kay’s sparse clouser pulled in most of the fish. The kayaks travelled 3.08 miles upstream of the launch point exploring, and casting to likely holes, and pockets. 6.16 miles total travel, according to the GPS. Kayaks catching rates were just as good as the boaters. With the clarity of the water in the creek, the hard sandy bottom, and the fishy-looking structure on the shoreline, we may have to make this trip again in the summer. There were no eating or cooking utensils in the cabin when we got there, so we wound up flipping the bratwurst with fingers and a fork, on Friday night. 24 bratwurst gone in very short time. The only 2 fishermen anywhere Sunday in the pouring rain were Tim’s 2 boys. They were agitating to go out in the kayaks. These boys wanted to fish! What rain? What cold? Puck- I’m going to do my best to make it and bring my boat. I can probably fish 2 people at a time so it would be myself and 2 others and we can rotate. But I only live about an hour from Harmon Creek so I’ll just be coming up Saturday morning. I’ll work on getting a kitchen pass because I’m gonna be in Louisiana the weekend of 2/20-21. You might want to let the folks know that there are lots of tent sites at Harmon Creek – and I believe that many of them have power at each site – for heaters, etc. Brave souls might be interested. Also, renting a pop-up trailer is another option – but I think RV spaces are all booked. He might let a pop-up park in the tent area if the ground isn’t too soft. I just talked to Pop and he said right now they’re “flooded out” but should be no problem by 3/4. I’ll be in my RV. Catch and release is advised. These guys have reserved a sleeping space in the cabins but have not signed up for the trip. Sorry guys, still no forum.